Decorative Life: From 2-4 plus weeks depending on environment. Will respond to B-Nine or Florel to produce more compact plants with more flowers. Diascia is from the Greek “dis” (two) and “askos” (sac), referring to the sacs marked by yellow and maroon patches on the corolla (inner petals) known as ‘windows’. 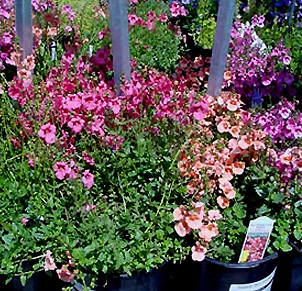 Some favorite cultivars and their respective flower colors include ‘Strawberry Sundae’ (pink) and ‘Whisper’ (cranberry red). Will generally do well in light levels at least bright enough to read a newspaper in comfort but more light would be better.